If you has any problem with this watch ,you can E-mail to us. We will solve your problem as soon as possible. The style is suitable for any occasion. Its classic black dial, durable stainless steel case and genuine leather band give you a very soft and excellent appearance, making it perfect for both sport and casual activities. This watch displays Date/Week/Hour/Minute/Second, providing precise time keeping. *Environmental protection vacuum plated black steel case,not easy to fade. *Dual display and quartz movement for accurate time keeping. *Smooth steel craftwork,won't scratch your wrist or cloth. 1.Clean the watch band with a soft cloth on a regular basis. 2.Constant contact with water can reduce the durability of your watch. 3.Avoid the use in extreme hot or cold temperature. 4.Please don't press any button underwater. Before swimming,please take off the watch. 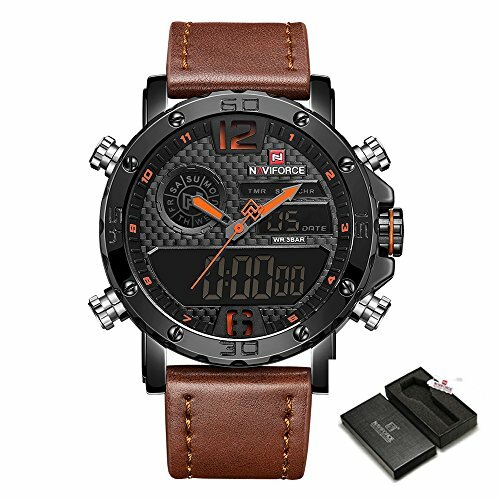 EXQUISITE DESIGN: Sport style men watch, orange 12 hours Arabic numerals pattern in the dial, LED date window, time and week display. MOVEMENT AND MATERIAL: High quality imported Japanese quartz movement with Dual display. Stainless steel case. High hardness mineral glass. Soft brown genuine leather band. FUNCTION: 1/10 second chronograph,time display, date display, stopwatch, waterproof, Shock Resistant. WATERPROOF FOR DAILY USE: 3 ATM Water resistant, Hand wash, withstands rain and splashes of water, but do not showering, diving, snorkeling or water-related work. ENJOY BETTER SERVICES: We provide 12 Months Warranty, 30 Days Money Back and aim to give a better shopping experience to our customers. If you have any questions about this product by NAVIFORCE, contact us by completing and submitting the form below. If you are looking for a specif part number, please include it with your message. © 2019 - watchessales.org. All Rights Reserved.